Ever seen a Prescott on a Prommie? Perc shows us how to make a Prescott 3.0 GHz exceed 3.8 GHz! Weldzilla thinks that Cadaveca needs to ditch the stickers, and the wiring needs some work. NeVeRmiNd likes it just the way it is. I think it looks like a work in progress :). What do you think? Danrok shows us how the Koolance Exos performs! 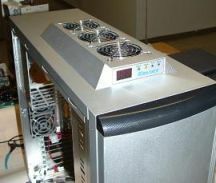 The Exos unit is hooked up to the CPU-300 cooler which is rated for CPUs which generate up to 300w of heat. It uses hose with a 1/4" or 6mm internal diameter. There are various cooler blocks available for the CPU, GPU and mainboard chipset. For now, I am just using the CPU cooler. FPSfreak brings the Silver EXOS from out of the shadows, and into Lian Li. "The case is going to be the Lian Li PC73 SL cooled by a modified Koolance Exos Al unit. The mod being the unit will be recessed into the top of the case for a (Hopefully) Factory look." Side Blown and cool off the line! Off to the side, better than inside? You gotta "love" this pink PC with the heart window. I am getting ready to do a similar one for my neice's graduation. "The Love heart window made with only a drill and a round file"
Our users show us their rigs!